… a talented graphic artist who has done a number of other RPG commissions over the years. As the 3WW grinds on, accumulating battle losses overwhelm repair and manufacturing facilities for all sorts of vehicles, especially armoured vehicles of any sort — as does increasing disruption of the supply chain(s) needed to keep the manufacture of such vehicles ticking over (and, eventually, the Thirty Minute War — the nuclear exchange — wipes out most of the heavy industrial facilities capable of manufacturing any major military vehicles. However, ingenuity on all sides means that remaining facilities are repurposed to salvage and remanufacture nadly damaged or nominally ‘wrecked’ vehicles. The US and NATO found themselves with increasing numbers of salvageable tank hulls lacking turrets and a declining ability to build new armoured vehicles of any sort just as the Russians had (see the BTR-T and BTR-P entries) and also had the example of the Israeli Achzarit T-55 conversion. As a result, they eventually started their own program of converting salvaged, surplus or reserve tank hulls into Heavy APCs. The most common conversion fielded by the US and her allies in the European and Middle Eastern theaters was based on the M-60 Patton – and was formally named the M-600 Powell APC(H) by the US, though the troops (displaying the expected gallows humour) commonly referred to them as either M-666’s or as Zombie Armour. The main difference between the US and other similar programs was that the majority of M-600’s were provided with salvaged APC turrets, either from LAVs (M-600a1) or Bradleys (M-600a2), though a small number (M-600a3) mounted Stryker Mobile Gun turrets. A very few (M-600a4) were equipped only with a remote machinegun mount (controlled by a gunner from the inside of the APC) or (even fewer) with a simple pintle mount, normally for a machinegun, (M-600a5) at the track Commander’s position. No, there’s no artwork for this hypothetical beast – but their could be if some of the Stretch Goals for the KS are reached when it is launched! The dogs of war have been loosed – the world is facing down nuclear and biological Armageddon between the West and two ruthless power blocs aiming at nothing less than total victory and the complete emasculation and/or destruction of anyone who opposes their cultural dominance. The struggle between these blocs has been going on for years, but has only recently become a hot war … normally called the Three Way War in the west, the Anti-Imperialist War in the Russo-Japanese alliance and the New Jihad in the Islamic states … and a nasty one. Rationing is commonplace, consumer goods in short supply or, in some cases, completely unavailable … even the militaries of the nations involved have begun to suffer from the inability of their damaged national economies to build the needed equipment for their expanding war efforts (or, indeed, even to repair or replace damaged equipment). Can they do enough to make a difference? The graphic? 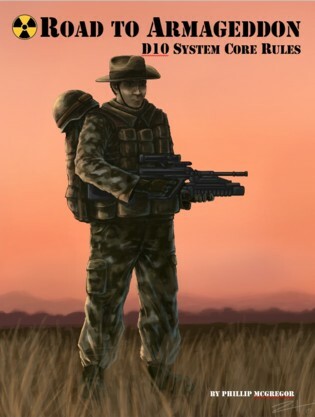 The current Front Cover for the first book, Background and Game System. Most modern themed RPGs or campaign backgrounds emphases US or NATO forces, usually pretty close to the exclusion of all else – but Road to Armageddon occurs in a world where they;re going to end up involved in a nasty, brutish, devastating conflict that ultimately escalates into WW3 and a nuclear exchange (the Thirty Minute War) and continues well beyond, descending into the depths of crazy mutual annihilation (as best as reduced circumstances allow, anyway).